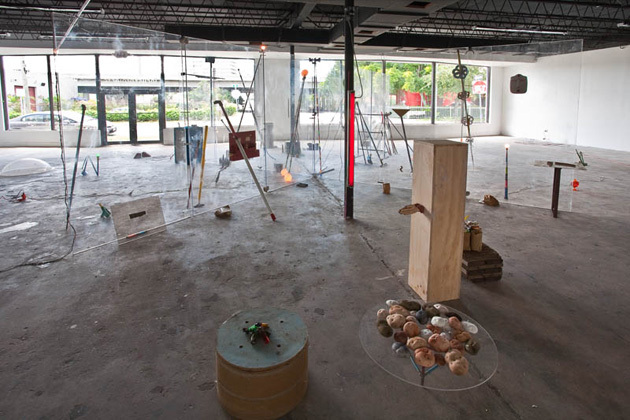 Locust Projects is pleased to present + "Plus Sign," a solo exhibition by Austin-based artist Andy Coolquitt. For this new work, Coolquitt will create an architecturally specific installation on an immersive scale never before attempted by the artist. 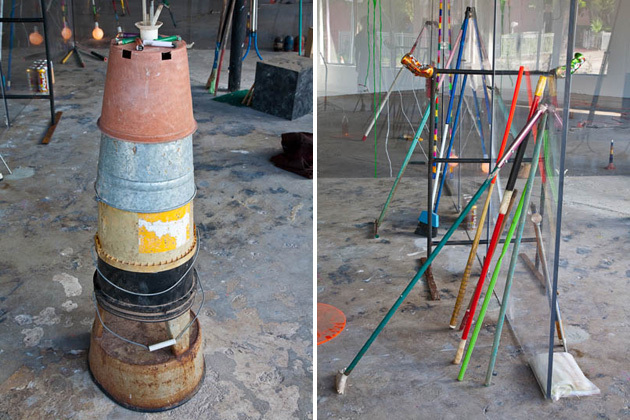 Known for sculptures made of joined pipes, broom handles, discarded lighters, beer bottles, light bulbs, straws, and crayons, Coolquitt's assembled works are minimalist, ordered rearrangements of the raw world from which their components are sourced. 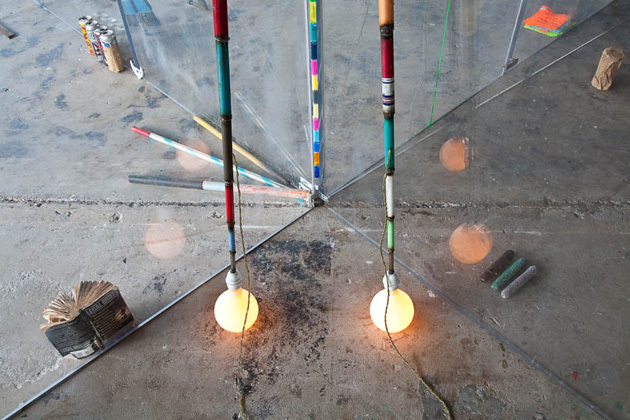 + will consist of four unique installations set within the intersection of large 3/4" clear Plexiglas sheets. Creating four corner platforms within this larger structure or pavilion, the work will exist within the separate, yet transparent environments and fully function in each. Using a vocabulary of humble materials, the individual installations will employ a variety of every day and modified objects. 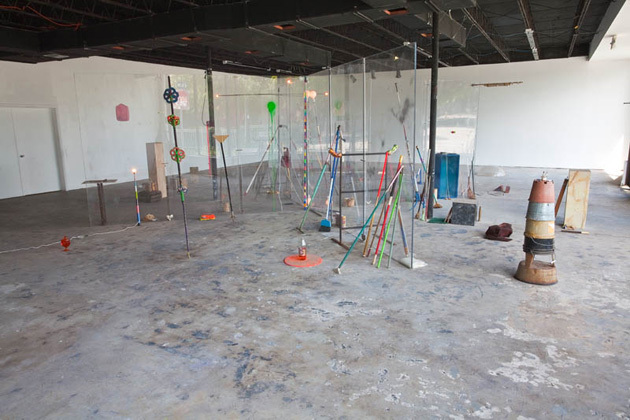 Expanding on Coolquitt's "somebody-made" sculptural assemblages of the past two years, + will be a joint between architectural sculpture and discreet objects, performance and work, and public and private spheres. Reminiscent of Dan Graham's architectural pavilions and Duchamp's Large Glass, this work picks up an art historical dialogue of objecthood and the de-centered viewer, and speaks to theories of the "third space" presented by writer Edward Soja. Coolquitt has also created a limited edition of the same title, in the form of a 7" x 7" book. 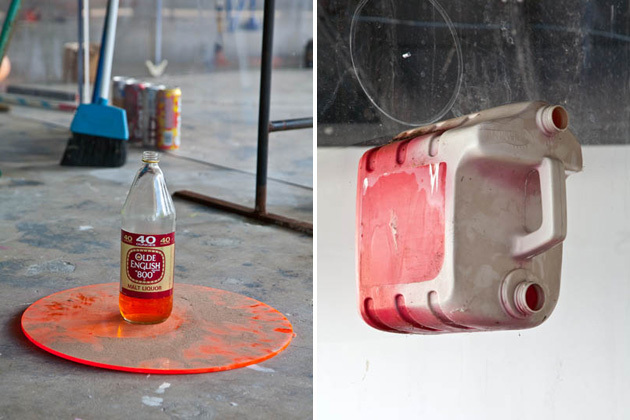 For this project, he brings together his ongoing archive of photographs documenting the residue of outdoor living rooms. The images are juxtaposed with a streaming text that the artist likens to a sort of "soundtrack". 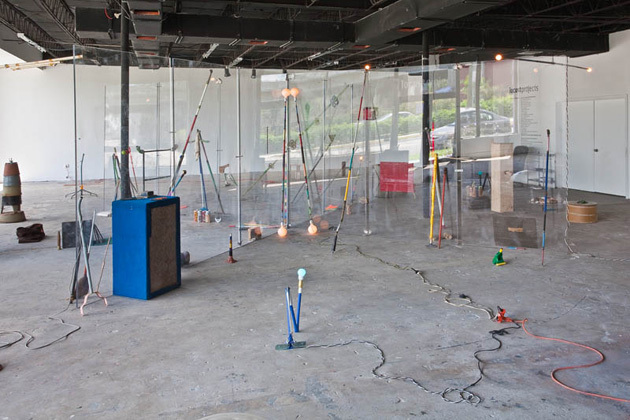 Recent solo exhibitions by Andy Coolquitt include "WE CARE ABOUT YOU," at Lisa Cooley, New York. Group shows include Johan Koenig, Berlin, Germany; and Zero, Milan, Italy. Upcoming group exhibitions include "The Craft," organized by Melissa Brown, at Lehman College Art Gallery in New York and "Illuminations," organized by Matthew Higgs, at Tony Shafrazi Gallery, New York. 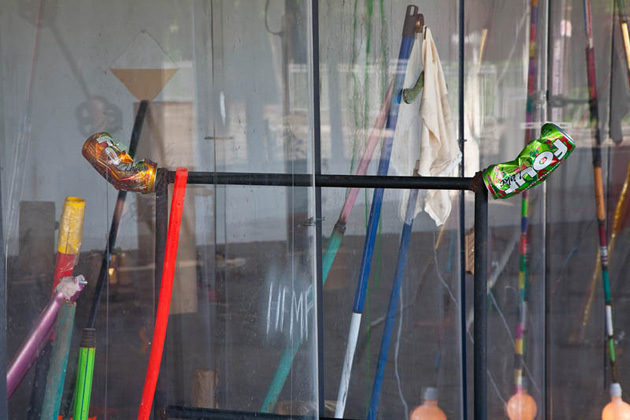 In 2012 Coolquitt will have a solo exhibition at the Blaffer Museum in Houston, Texas, curated by Rachel Hooper. Locust Projects' exhibitions and programming are made possible with the support from: Andy Warhol Foundation for the Visual Arts; Galt & Skye Mikesell; John S. and James L. Knight Foundation; Hannibal Cox Jr. Foundation; Miami-Dade County Department of Cultural Affairs, the Cultural Affairs Council, the Mayor, and the Miami-Dade County Board of Commissioners. Special Thanks: Lisa Cooley, New York; Laird Plastics and Plaskolite, Inc.